Juicing Advice is your place to get top tips on how to enjoy juicing and discover the health benefits. 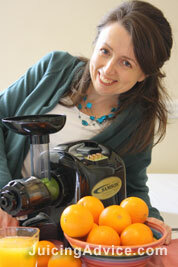 I’ll also offer you advice on how to choose the best juicer for you if you don’t already own one. Juicing is easy, great fun and inexpensive. On this site get free inspirational recipes and advice on how to get started. With a wide range of vegetable and fruit recipes there is something here for everyone. Most people are aware that we need our 5 portions of fruit and vegetables, but not everyone likes to or has the time to prepare them. If you fall into this category then drinking juices is your answer. Here you’ll discover how to create your favourite juice and vegetable recipes that also benefit your health. I’m here to help you discover juicing, learn about different types of juicers and show you what to look for if you want to buy a juicer. I’ll also show you the advantages and disadvantages of various types of juicer in our juicer reviews section to help you choose the juicer that is right for you. I really hope you enjoy this site and that you enjoy juicing as much as me. Please contact me if you have any questions.